Although your child’s first teeth will eventually be replaced by adult teeth, there are many cases in which restorative dentistry may be the best course of action for your child. Primary — or baby teeth, are important for many reasons. Not only do they help your child speak clearly and chew naturally, they also aid in forming a path that permanent teeth can follow when they are ready to come in. Some of the baby teeth are necessary until a child is 12 years old or longer. Pain, infection of the gums and jaws, impairment of overall health and early loss of teeth are just a few of the problems that can happen when baby teeth are neglected. Also, because tooth decay is really an infection and will spread, decay on baby teeth can cause decay on permanent teeth. We combine the latest technology and dental products available with sound techniques proven by research to support your child's comfort and dental health. 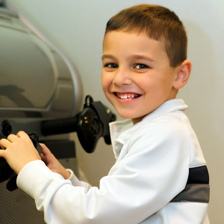 At Toothworks Pediatric Dentistry, once your child is comfortable, the infected portion of the tooth is removed. We then restore your child’s beautiful smile with white resin that bonds to your child’s existing tooth structure. We always stay current with the latest dental literature and base all of our decisions on what is best for your child and what is supported by research. Dr. Harvey uses composite resin filling material whenever indicated. Toothworks Pediatric Dentistry is an amalgam (silver) free dental practice. Resin restorations have many advantages over amalgam fillings. Resin restorations require a smaller preparation, which means removing less tooth structure. Some resin materials can release fluoride into the tooth to help prevent further decay. Resin restorations are more technique sensitive than amalgam fillings and require more care when placing them. We feel your child is worth this extra effort! The American Academy of Pediatric Dentistry recommends that when three or more surfaces of your child’s baby tooth are decayed, the whole tooth should be covered to prevent it from decaying or breaking more. At Toothworks Pediatric Dentistry, Dr. Harvey offers stainless steel crowns — which are adapted to cover your child’s existing tooth to the gumline after the infected tooth structure is removed. Dr. Harvey may also recommend covering a baby tooth with a crown in the cases of fractured teeth, malformed teeth, excessive tooth grinding and after a nerve treatment to protect the remaining tooth structure. Also known as caps, crowns are placed on the tooth with dental cement. Hard or sticky foods and candies should be avoided. If the crown becomes loose or painful, please contact our pediatric dental office immediately. Please note that this and all dental procedures require follow up and no dental treatment will be successful unless accompanied by proper oral hygiene. Dr. Harvey has undergone specialized training to treat primary (baby) teeth. They are treated differently than permanent teeth and not all dentists follow the AAPD recommendations. If a filling were to be done on the tooth after Dr. Harvey has recommended a stainless steel crown, the filling could fail. Your child might need to have the tooth retreated in the future — which might not be covered by your insurance — or extracted. In most cases, the stainless steel crown should last until the tooth comes out naturally. At this time, there are white crowns for the front teeth. Some companies are starting to make stainless steel crowns with a white coating on the cheek side for the back teeth (molars) or all white crowns. We keep up to date on the current materials on the market and look for esthetic alternatives that will match the superior functional qualities that the stainless steel crown offers. In select cases, an esthetic crown may be an option for a back tooth. 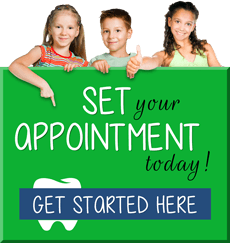 Ask Dr. Harvey if esthetic crowns are an option for your child. Root canal therapy will protect a tooth from becoming abscessed. It is needed when the dental decay (cavity) is deep and may reach the pulp (nerve). This procedure removes the inflamed (affected) part of the nerve and leaves the healthy part intact and protected by medicated filling. It is recommended that your Grosse Pointe pediatric dentist places a stainless steel crown (silver cap) over the tooth as a final restorative measure. These caps are prefabricated but will be trimmed and fitted to your child’s tooth. Please be advised that all dental procedures need follow up, and any dental procedure will not be successful unless accompanied by good oral hygiene combined with daily brushing and flossing. To learn more about Grosse Pointe pediatric dentist Dawn Yuen Harvey D.D.S., M.S., any of our restorative pediatric dental services or to request an appointment, please contact us here or call our office directly at 313.343.8790.